Parents all over the world are expressing worries over a new challenge game known as the Momo Challenge, a game rumoured to be a suicide challenge on WhatsApp and other social media platforms. The Momo Challenge has been linked to the death of a girl, and is already taught to be the the successor to the Blue Whale challenge, another disgusting mind manipulating game that killed several teens last year. How does the Momo Challenge work? The Momo Challenge usually starts when people message or add a Momo-associated contact on their WhatsApp or profile on Facebook, or any other social media platform that its on. Once contacted, Momo may threaten to appear at night or curse people who don't respond to messages sent by her. According to the Computer Crime Investigation Unit in Mexico state of Tabasco, the game is said to have started in a Facebook group where members were challenged to communicate with an unknown number. However, several users on the Facebook Page were reported to say that Momo responded with violent images and they were threatened if they refused to follow the order given by the game. 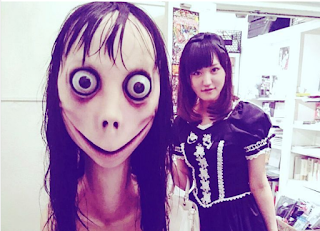 The Avatar used by Momo is an image of a woman with grotesque features and bulging eyes taken from the work of Japanese artist Midori Havashi, who is not even linked to the game in any way. 9News explained that players of the game are doxxed and convinced to harm themselves or threatened that their private information will be leaked in the public. Sometimes the game even threatens the player to hurt the people they love in order to force them into playing by the rules of the game. One father explained to Diario Popular how the game threatened his 15-year-old daughter with death. the man said a Momo-connected profile sent the girl a picture of a dead person and threatened her home, family, and friends if she didn't respond. "It is better to ignore the challenges that come in the fashion in WhatsApp," the National Police of Spain warned. Several phone numbers associated with Momo on WhatsApp includes a Japanese phone number that starts with 813, another from Colombia that starts with 52, and another one from Mexico that starts with 57.